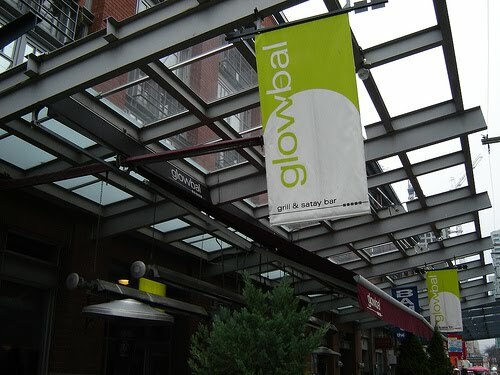 Located in the always happening Yaletown (Vancouver BC), glowbal grill: steaks&satay is a great spot not to be missed. Their sophisticated style is evident from the outside; gold snakeskin suede banquettes, brass-branded gold chandeliers and round mirrors hung around the room. The back lounge of the restaurant is called AFTERglow and features an onyx bar and slinky sofas. The patio is equally impressive and comfy - a great place for outdoor lunches or even summer nights drinks. 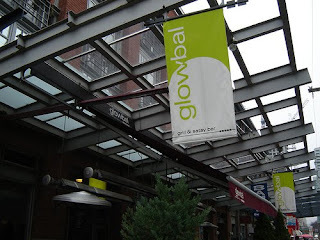 There menu is "globally inspired," a mix between exotic and regional ingredients and flavours. Their steaks and satay's take center stage but their ahi tuna nicoise is not to be missed.